ProCell Microneedling helps to renew skin for a more radiant, youthful glow. Microneedling encourages skin cell self-renewal without harsh chemicals, abrasives, or lasers. 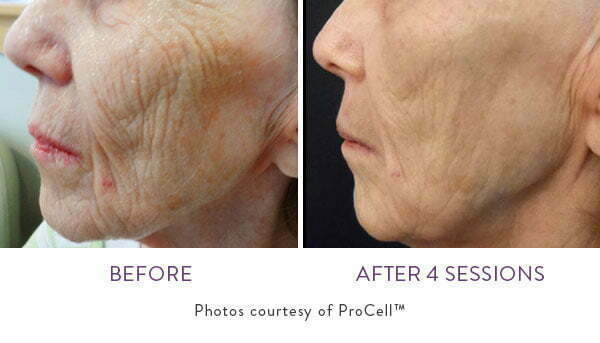 ProCell Serum delivers powerful stem-cell derivatives for more robust cell repair. Safe for all skin types to help tighten skin, smooth out fine line, reduce scars, and balance skin tone. Did you know that your body already has most of what it needs to repair skin damage and rejuvenate your appearance? Collagen and elastin are two building blocks of healthy, youthful skin that the human body can manufacture and use to regenerate healthy tissue, including your skin. Board certified plastic surgeon Dr. Gregory Buford has long recognized the benefits of harnessing the body’s own capabilities for healing and rejuvenation, and his innovative ProCell Microneedling treatment unlocks natural skin repair mechanisms to tighten and smooth skin and restore a more radiant, youthful appearance. Microneedling is a non-surgical procedure that involves creating a series of microscopic punctures in the skin’s surface with a hand-held device. By intentionally creating minor, painless injuries to the skin, Dr. Buford’s microneedling technique prompts the natural production of collagen and elastin. This allows your body to naturally repair signs of damage for smoother, firmer, and healthier looking skin. Dr. Buford enhances the benefits of microneedling with an infusion of ProCell serum containing powerful growth factors including stem cell derivative cytokines, TGF beta-3, IGF-1, and anti-inflammatory age fighters. This advanced serum cocktail accelerates skin cell renewal for more timely, noticeable results than microneedling alone. While many providers couple microneedling with a serum, Dr. Buford exclusively uses ProCell, which use human stem cells derived from healthy marrow donors. Human bone marrow stem cells have been shown to offer superior cellular repair and regeneration compared to growth factors sourced from plants, fat tissue, or other animal sources. Dr. Buford can use ProCell Microneedling to improve skin on the face, neck or body without chemicals, harsh abrasives, or lasers. There is very little risk for side effects and virtually no downtime following treatment. ProCell Microneedling is safe for all skin types. Do you want to learn more about ProCell Microneedling in Denver? Please contact us for a consultation with board certified plastic surgeon Dr. Gregory Buford and his Physician Assistant Kaitlyn.